Ikea’s Vika Amon desks aren’t the sturdiest or most solid desktops ever made but they’re cheap (AU$87). And I’m cheap so I bought one. Any loudspeaker placed on this desk will probably affect significant bass rumble. A loudspeaker that didn’t go overboard with heft and bass punch would be required. That ruled out the Usher S-520 – my usual go to budget standmounts. Usher’s entry-level boxes come with the caveat of needing serious juice to get ’em out of bed and dressed for work. Enter PSB’s Alpha B1. The Australian retail price on these is AU$449 but I’ve seen them offered for substantially less. The Alpha B1s aren’t new or fancy. Their appearance is fairly workaday (which is fine with me). Metal grills keep out sticky, pokey fingers so they’ll suit anyone with children. 90db efficiency pegs the Alpha B1’s at the upper end of the standmount efficiency spectrum; this makes sourcing a matching amplifier that little bit easier. Initially, I went with the recently DAR-KO awarded Wadia 151PowerDAC Mini and enjoyed splendidly transparent results. The PSBs sound best with an amplifier that puts more meat on the bone (not the Wadia in this case) as well as something that’ll hold back that tweeter from getting too edgy. The metal dome makes for a presentation that’s bright-eyed and bushy-tailed. Sharper transients lead to more than satisfactory detail excavation which travels ahead of midrange eloquence and transparency (perfectly acceptable in the context of the RRP). These PSBs excel in the reproduction of electronic music. Crucially for my desktop needs (and similar to the Epos ELS-8) bass is far from weighty or ponderous. It’s fast, nimble and serves up good note shape and texture. Ikea desk rumble is minimised. The PSBs don’t have the organic flair of the likes of the 47Labs Lens or ProAc’s Tablette Reference 8s. 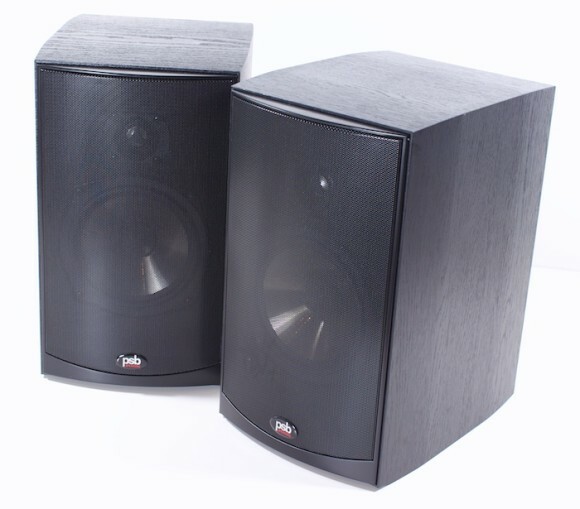 Get this down ya: the Alpha B1s DON’T compete with speakers two or three times the price! How’s that for knocking a painfully ubiquitous cliche on its arse? Neither are these entry level PSBs as laid back or as smooth as the Epos ELS-8. PSB pragmatism summary: a relatively easy load for lower-powered amplifiers, the Alpha B1 don’t attempt to ram lower frequencies down yr gizzard, they’re physically unobtrusive and offer satisfactory transparency. These speakers don’t need a lot of go juice to sound optimal. Paired with the aforementioned Wadia, the presentation was big on glitter and sparkle — plenty of detail without a desktop overload of dynamic slam. Direct-digital implementations like this are especially good at keeping low frequencies on a tight leash. A pair of AKG K-702 is primarily why I bounced the Wadia (which I adore) for the Peachtree Nova125 (US$1600). With more than 125 horses running into the PSB’s nominal 6 ohms there was no sign of pant-seat sag with the Peachtree either; itself smoother in the top end and a purveyor a thicker midrange soup (especially with tube engaged) than the outgoing mini Wadia. The Peachtree has the more prominent mid-bass. Let’s assume the idealists are correct: that Class D can’t quite keep up with the BEST linear designs at a similar price point. Which $1500 Class A/B integrated also bundles an in-built DAC and headphone output? Strike one up for pragmatism. I don’t recall the Nova125’s predecessor (the iNova) being able to drive the AKGs with such determination and finesse; 9pm on the volume dial is plenty loud enough. 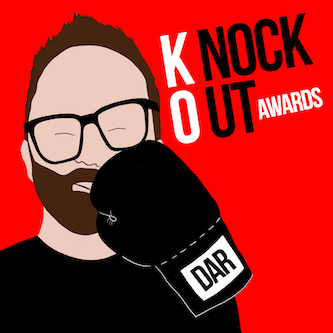 10pm pushes safe listening levels. Headroom to spare – very nice. The Nova125 also offers pre-outs lest the end user goes with active desktop speakers. I’ve been spying the Emotiva Airmotiv 4 for a while now. Steve Guttenberg reckons them to be some of the best in the <$500 bracket. 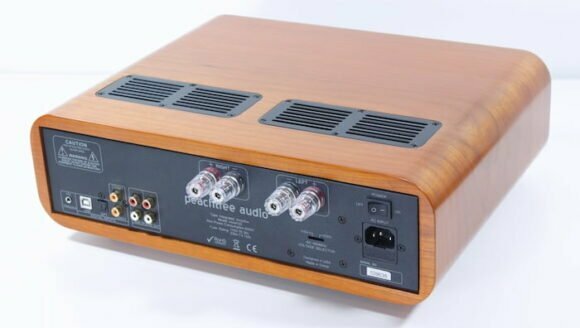 Sure, I could go vintage and use the pre-out of the still spiffing NAD 3020 – it too has a headphone output – but where’s the DAC, mister? There’s more. The desktop space is where I listen most often to streaming services (MOG, Spotify), bounce in my chair to Soundcloud-hosted DJ mixes and watch the occasional YouTube clip. Team Peachtree takes care of this too: switching in the blue-glow of the tube buffer takes the edge off those lower-bitrate metallicised transients, fattening up the sound for an altogether cosier/cuddlier listening experience. You get 80% of the REDGUM’s soundstage and tonal colour for two thirds of the price. 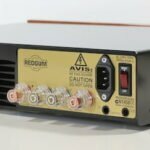 If you require the flexibility of an extensive feature set, our old friend pragmatism says that this is the amp for you . It might not sound as tonally rich as a pair of Pass Labs monos but it isn’t really aimed at that market. Neither is it as expensive as the (frankly stunning) REDGUM RGi60. Peachtree Audio are all about maximising the broader value proposition. There exists an abundance of well-established integrated brands within spitting distance of the Nova125’s price point: the Rega Brio-R is cheaper and sounds more humid whilst the Naim Nait 5i probably offers greater drive and timing. Both the REDGUM RGi60 and the Rega Brio-R are strictly loudspeaker-only deals. Ditto Cyrus 6XP, NAD C375BEE (which does drive cans) and the excellent Exposure 2010S2. 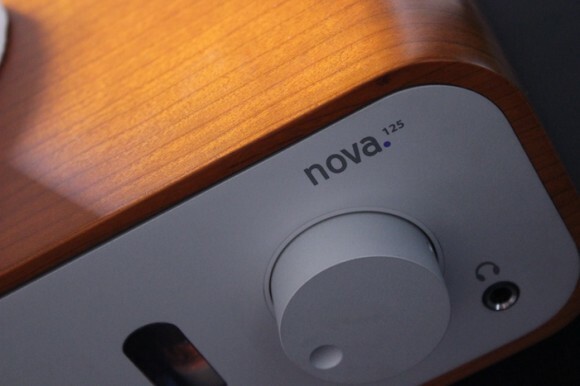 Only with the Nova125 do you get headphone output, tube buffer and DAC. The Peachtree Nova125 is an eleganty styled integrated for pragmatic consumers who want Swiss Army knife tooling with their tunes. Its pairing with the PSB Alpha B1 makes for one knockout desktop setup. One that minimises desktop rumble, maxes out sticker-price-commensurate detail, offers tube softening for web streamed media and that near mandatory desktop facility: headphone listening . Moreover, this $2k system is easily transferrable to lounge room duties. Add stands, job done. And if you’re wondering why I’ve yet to mention the Nova125’s closest rival – Wyred4Sound’s mINT – well, there’s a showdown a-comin’. One-quarter of the money on the speakers and three-quarters on the amp? Even considering it’s a DAC-amp, you’d be better off spending more on the speakers than on the amp. After running more expensive amps with the MMGs, I’m starting to rethink the conventional wisdom of spending 70%ish of budget on speakers. What $2k desktop combo would you buy then? 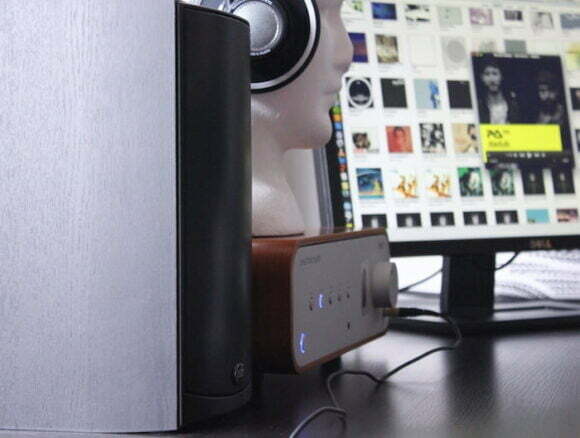 What about the centrance Desktop audiophle system then? (now at 1499$)best regards. OOoooo…. Looking forward to the Nova 125/ WFS Mint showdown. Both look great on paper and have read good things about both. First – thanks for your great reviews! For the desktop I have Anthony Gallo Reference Stradas (1400 EUR)powered by Dayens Ampino (300 EUR). Same price, opposite speakers/amp ratio. I think this is an ultimate desktop system – probably cannot be beaten by any other combination at similar price. Best part – it can be used as whole room dedicated music system as well if needed. P.S. I’m also trying Magnepan MMG’s with various amps, with quite interesting results. My dilemma – do Stradas outperfom MMG’s for the dedicated music system duty? The Ampino is smashing little amp (although it didn’t blow my socks off as much as it did Srajan’s). I’ve yet to hear a pair of Gallos but I’m keen to. 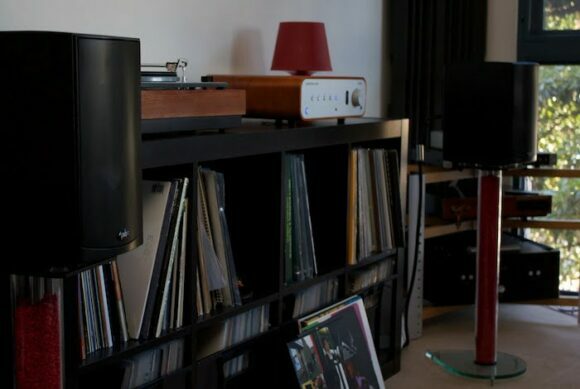 I’ve owned the PSB Alpha B’s for 10 years now and they have never embarrassed themselves no matter which of my amps they have been connected to – currently a Musical Fidelity X-150 fed by a Schiit Bifrost, I’ve also added the PSB 8″ entry level sub – a perfect match. Re pricing – though I paid $300 for the Alphas 10 years ago they now sell in Canada for $200 the pair everywhere – got the sub for $350. Manufacturers need to control the prices at which their distributors sell to retailers so as to rationalize the price from country to country as does Pro-Ject and its done well for them. what about the centrance ADS for exemple (now at 1500$) how will it compare to the peachtrea alpha combo? Yeah – that’s better suited to the desktop. The Peachtree/PSB setup is better suited to larger spaces.